Once in a while there is a rare occurrence allowing me time to actually read the blogs that my Bloglovin’ email sends me. The other day one title in particular caught my attention. Unbelievably Good Cashew Coffee. Until recently I had not been a cashew fan. Until recently I had not been a coffee fan. So the fact that Unbelievably Good Cashew Coffee even tempted me is a bit surprising. It sounded so comforting and cozy and warm and I decided I had to try it. I’m not a hot coffee drinker. Here in Rhode Island that is probably a good thing because it seems like even in the dead of winter people drink their coffee iced. So I made this recipe iced. And then I made it hot. But only because I found the absolute cutest coffee cozy at Salt in Mystic, Connecticut made by nn handmade. And now, I’m addicted. Not for my morning get me going coffee- that will forever be iced soy lattes. But for the afternoon, when you need something special just for you. When you are running down the street to get the kids off the bus or driving to and from the numerous after school activities. This little coffee cozy and some super creamy cashew coffee in one of my favorite travel mugs? My new favorite thing. The best part? It is so easy to make. The flavor reminds me of one of my favorite 1980’s ice cream flavors- Heavenly Hash. Did you ever have it? I think it had marshmallows and nuts- it was chocolate (another surprise because really I don’t like chocolate based ice creams) Do they even still make it? I have not bought ice cream in so long I don’t even know. But the flavor of this coffee brought me right back. When I made it iced I cheated- I used a canned volcanic black cold brew by Kohana. 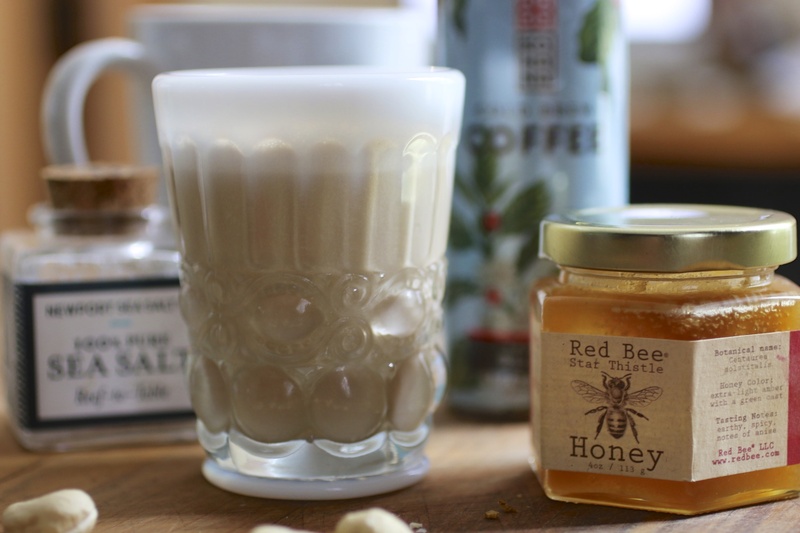 I followed the recipe from Pinch of Yum which added one cup of coffee (although I did not use decaffeinated coffee), 1/4 cup of cashews, a tablespoon of honey- I used star thistle honey from Red Bee, and a good pinch of salt. I used Newport Sea Salt. The result was just as promised- creamy, dairy free coffee. Hot, cold…so good both ways. I also loved that it is a dairy free coffee. Now I have another alternative to nitro coffee which my body can’t handle every day despite my love for the creaminess. Definitely going into the fall/winter drinks recipe line up here at our house. What are your favorite fall and winter specialty drinks? I’d love to know!